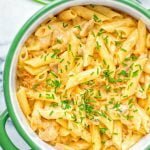 This Vegan Buffalo Chicken Alfredo is super easy to make, gluten free as well and so delicious. 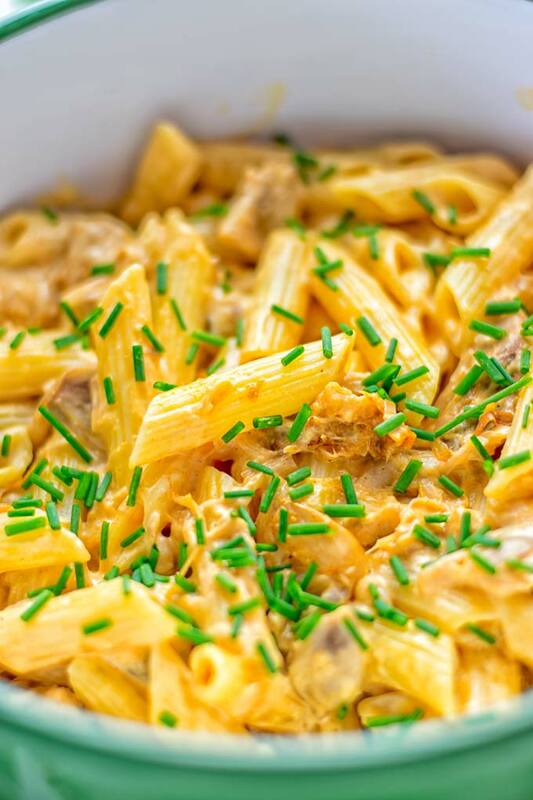 Full of spicy notes, with shredded jackfruit, it’s the ultimate comfort food for everyone. Before my vegan days, there was one dish I could eat almost every day. 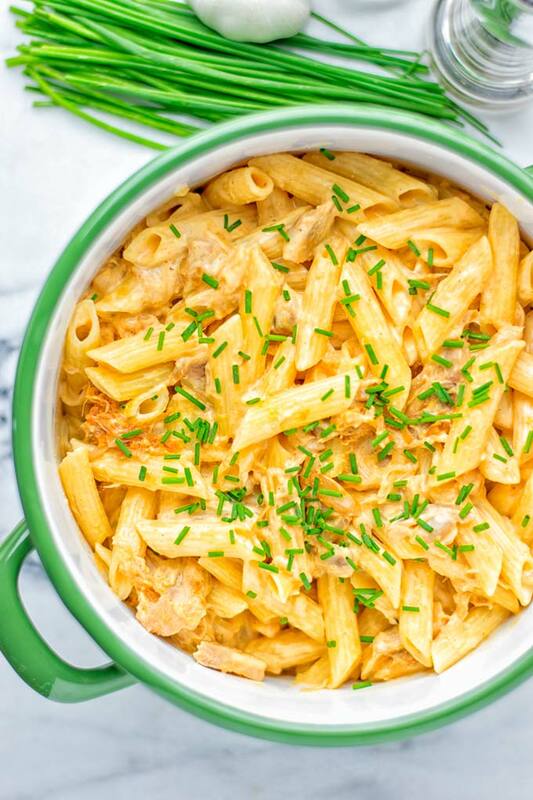 Seriously, I’ve never gotten tired by or bored of Buffalo Chicken Alfredo. It was one of my favorites. 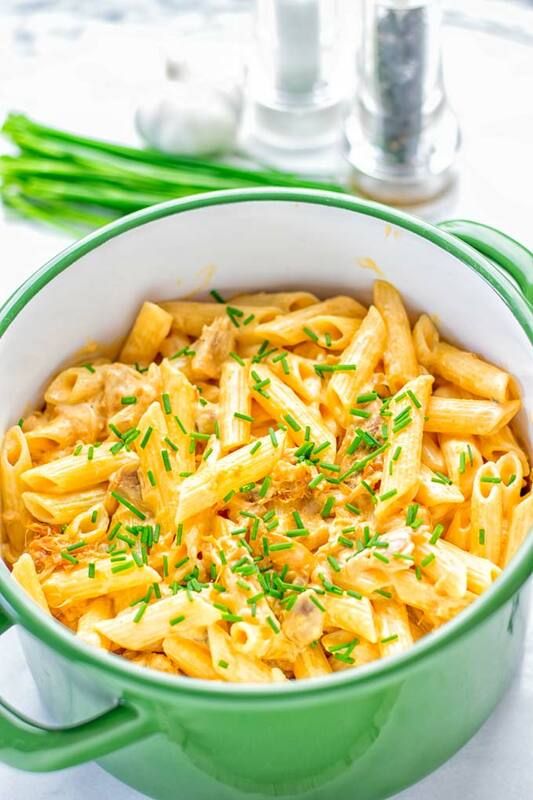 Who does not love a big plate of pasta dunked in creamy sauce. See not one plate left, everyone loved that. These were the times when I really didn’t have any cooking skills at all. Yup I can tell you my magic of cooking was using pre-made alfredo sauce from the jar. Throw in a bit of chicken, fried with some chili seasoning layered on pasta. that’s all. From time to time I added some mozzarella or parmesan to it. Luckily these times are definitely over, and I ditched all that artificial magic. One of my favorites, so I’m always up for big plates with my Vegetarian Fajita Pasta or the Creamy Asparagus Orzo with Garlic Parmesan. Both are seriously so delicious, plant based, and gluten free. Yup, you can really find gluten free orzo. Just keep an eye open for it. Of course you can use any orzo you like, if you don’t need it to be gf. 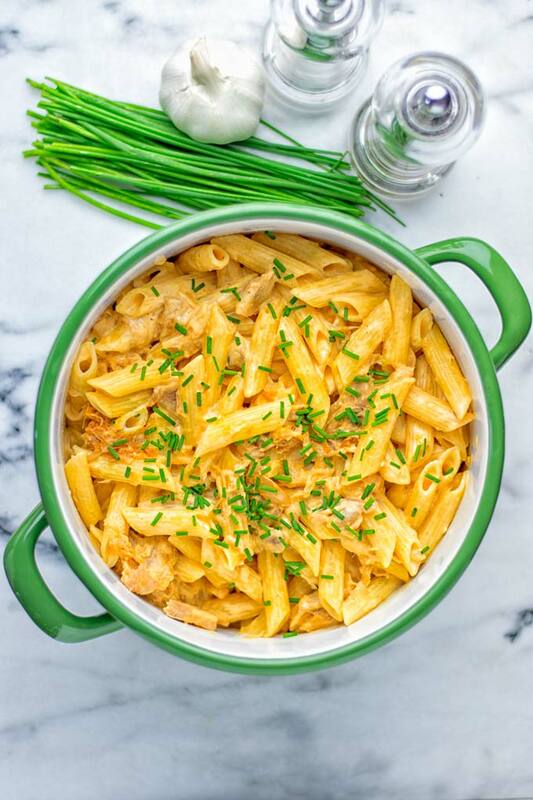 This Vegan Buffalo Chicken Alfredo is a magic combo because it’s finger-licking good, addictive, lip smacking, tasty, satisfying, filling, pure good comfort food. Just for everyone who really loves fast, easy, delicious, and good food. For real, all these attributes will happen. Friends, life is too short for bland and boring food. You might know what buffalo chicken is, if not no worries. It’s chicken marinated in a spicy buffalo sauce, and often fried or baked with some butter until done and crispy. We do something different of course. Instead of chicken, we use jackfruit, which is amazing for the meaty texture it provides. You will need a total of 3/4 cups of buffalo sauce that we split for marinating the jackfruit and for the alfredo sauce itself. I bought mine at a store which was vegan. So if that’s important for you, please check the ingredients carefully. If you absolutely can’t find one, try to make your own. Note: Please don’t just use hot sauce. Of course it will work, but it isn’t really the same flavor experience as with buffalo sauce. All you need for a buffalo sauce is hot sauce, dairy free butter (seriously butter, not oil or anything other), white vinegar, a bit of garlic (I would say 2 cloves is a good way to go) and of course a good pinch of salt and pepper. You can do it your own way, you don’t need any measures. If you wish a more intense butter flavor use more vegan butter, if you like hot food a lot, use more hot sauce and cayenne of course. Whatever you decide start with a small saucepan combine everything and cook all until it bubbles. 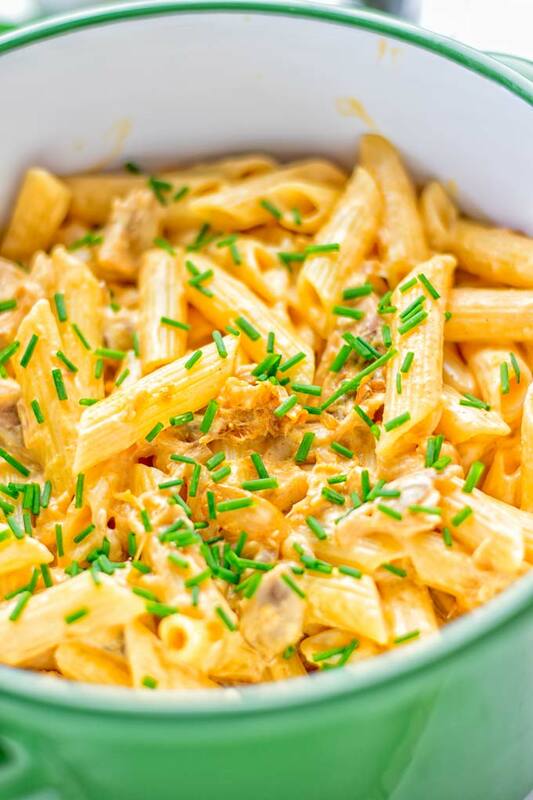 Alfredo is a sauce made of butter, cheese and cream. It goes well with pasta, rice, potatoes, or zoodles. But obviously this not plant based or dairy free. How to make alfredo sauce is easy. All you need is 3 basic ingredients: cashews, tahini, vegetable broth. And a blender. Just add all these ingredients and pulse until smooth and creamy. Set aside. It couldn’t be any easier. Start with your jackfruit. Shred it or cut into small chunks and marinate them. Use half of the 3/4 cup of your buffalo sauce for the marinade, add 2 minced cloves of garlic. Reserve the other 3 cloves for the sauce. Set aside covered in the fridge. While the jackfruit is marinating, cook your pasta according to package directions. Heat a skillet with a bit of oil or vegetable broth for a oil free version. Add the remaining 3 cloves of garlic and marinated jackfruit to that skillet and fry all until crispy and golden. 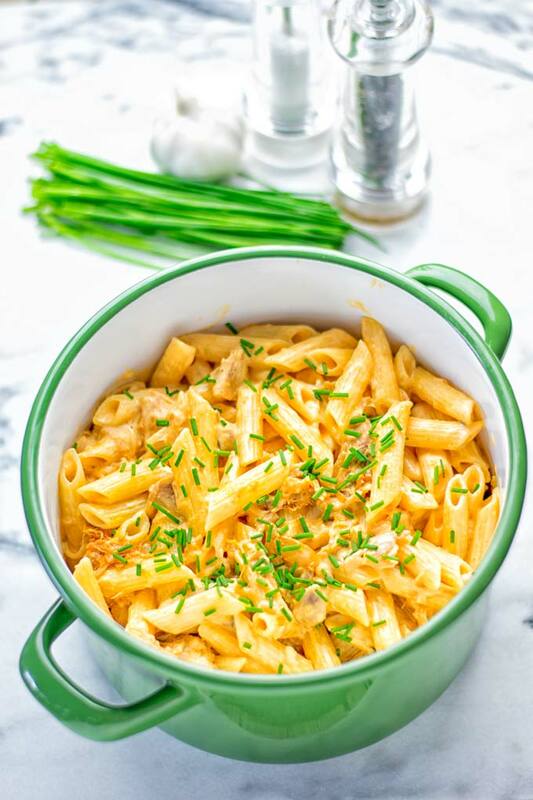 Finally, add prepared alfredo sauce (3 Ingredient Vegan Cheese Sauce), remaining buffalo sauce, optional nutritional yeast, and cooked pasta to that skillet. Cook for 5 minutes more, mix everything until well combined. Serve on plates or in bowls. Truly, this is a keeper for so many occasions, it will gone fast. 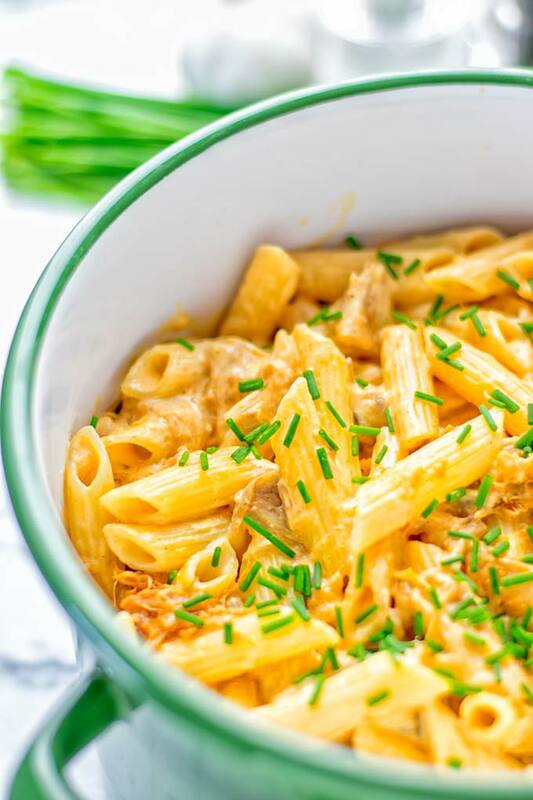 Give this Vegan Buffalo Chicken Alfredo a try, snap a picture, love seeing all your remakes with tag on Instagram or Facebook. Start with your jackfruit. Shred it or cut into small chunks and marinate them. Use half of the 3/4 cup of your buffalo sauce for the marinade, add 2 minced cloves of garlic. Reserve the other 3 cloves for the sauce. Set aside covered in the fridge. 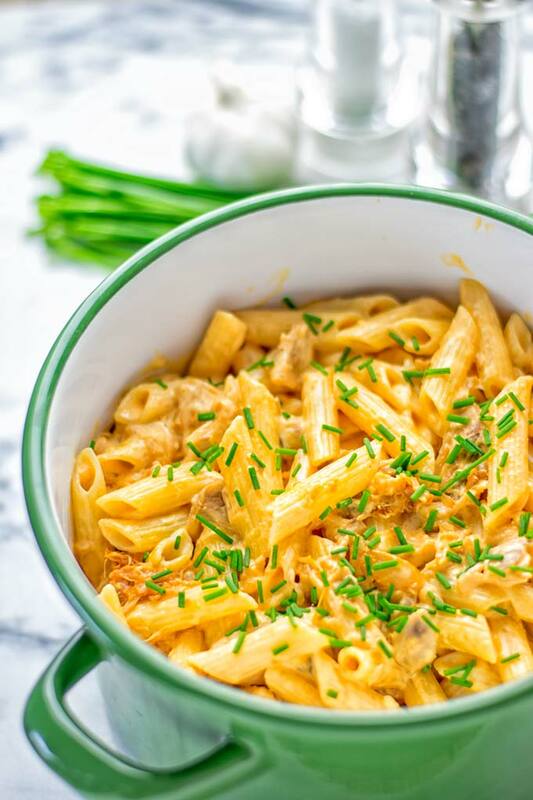 Finally, add prepared alfredo sauce (3 Ingredient Vegan Cheese Sauce), remaining buffalo sauce, optional nutritional yeast, and cooked pasta to that skillet. Cook for 5 minutes more, mix everything until well combined. Serve on plates or in bowls. I am going to prepare this dish tonight.